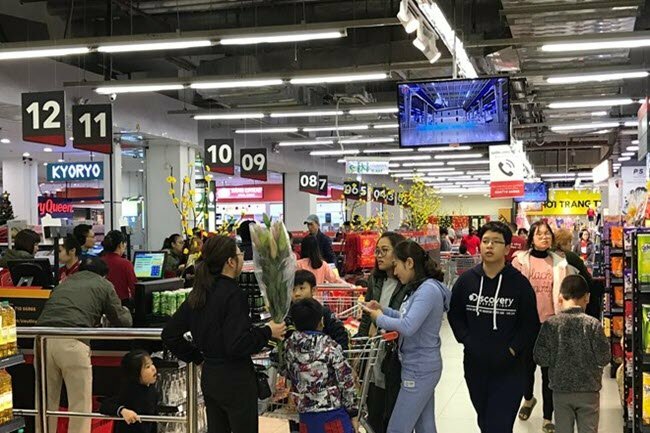 he Ministry of Industry and Trade has asked agencies to ensure sufficient supplies of goods, while guaranteeing stable prices for during the Tet holiday, local news site VietnamPlus reported. With the hikes in average incomes and Tet bonuses, the ministry forecast that the purchasing power among local residents will increase during this period by an estimated 10-12% compared to last year, as well as by some 15-20%, compared with non-holiday months. Accordingly, the ministry issued Directive No.08/CT-BCT in October 2018, asking agencies to work out solutions for balancing demand and supply during Tet, including organizing price stabilization programs. Also, the Departments of Industry and Trade in provinces and cities were urged to map out specific plans and support local suppliers with numerous activities to ensure there are ample goods available during Tet. According to reports that localities sent to the ministry, the stockpiles of commodities for Tet prepared by local suppliers have increased by some 20% compared with normal periods during the year, while stockpiled reserves for stabilization programs increased approximately 10% year-on-year. The stockpiled products are mainly essential items, such as rice, pork, beef, poultry and eggs, processed foods, as well as confectionery. Besides this, local firms this year continued to focus on improving food safety and quality, as well as the packaging of goods to be sold during Tet. Apart from stocking adequate amounts of goods, localities also placed an emphasis on the smooth operations of distribution channels to deliver Tet goods to consumers. Additionally, they have offered support to local firms in setting up outlets, and organizing fairs selling products to serve local residents in rural areas, industrial parks and remote areas.